View topic - Canoe color and wildlife? 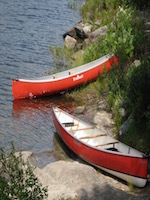 Post subject: Canoe color and wildlife? Alright folks, so we are finally situated to get our canoe. We're getting ash trim and...red. Green was also on the table, but I tend to be a fan of a red boat. The contrasting color and all that just looks great, imo. Have any of you noticed the color of your canoe significantly impacting your wildlife viewing, or even float hunts? Note: I am not talking about waterfowl, which are the only critter that I believe would be thrown off by a not-well-camoflagued boat. I am talking about elk, deer, moose, bear, and so forth. Anyway: color of boat - an issue for wildlife? Surely not...right? Last edited by gmb on November 11th, 2018, 8:24 pm, edited 1 time in total. Post subject: Re: Canoe color and wildlife? Deer have never noticed when we wear red or orange but my blue sleeping bag used on a cold morning alerted them every time. Thanks for the sanity check folks. And to Marten's point, blue seems to be an issue for ungulates. I find blue and dark colors that abstract to black at distance to be the worst. Now you are making me look up what wildlife sees color.. and sheesh its midnight. I dunno.A moose walked on my white canoe? You think it was mad at it or didn't see it? I dunno.